Abstract. Needle cast caused by fungi of the genus Lophodermium Chevall. is a common disease in pine trees in Siberia. Regression analyses relating needle cast events to climatic variables in 1997–2010 showed that the disease depended most on precipitation of two successive years. Temperature conditions were important to trigger the disease in wetter years. We used our regional bioclimatic envelope model and IPCC scenarios to model the needle cast distribution and its outbreaks in the 21st century. In a warming climate, the needle cast range would shift northwards. By 2020, needle cast outbreaks would already have damaged the largest forest areas. But outbreak areas would decrease by 2080 because the ranges of modeled pathogen and Scots pine, the disease host, would separate: the host tree progression would be halted by the slower permafrost retreat, which would in turn halt the potential pathogen progression. How to cite: Tchebakova, N. M., Kuzmina, N. A., Parfenova, E. I., Senashova, V. A., and Kuzmin, S. R.: Potential climate-induced distributions of Lophodermium needle cast across central Siberia in the 21 century, Web Ecol., 16, 37-39, https://doi.org/10.5194/we-16-37-2016, 2016. Lophodermium needle cast is a common disease in the genus Pinus. 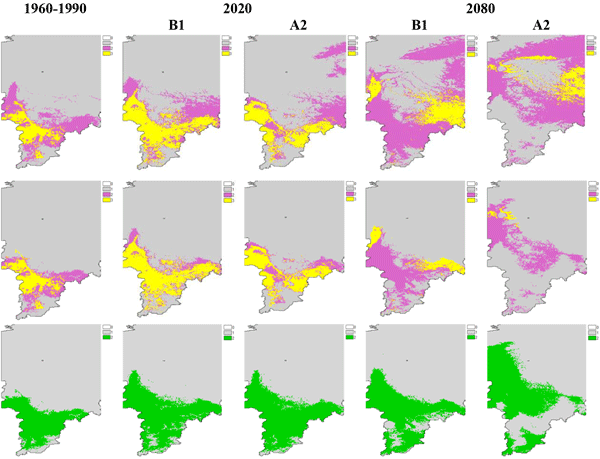 Our analyses relating needle cast to climate in central Siberia showed that the disease depended most on precipitation and summer temperatures were important to trigger the disease in wetter years. In a warming climate needle cast outbreaks would have damaged the largest forest areas by 2020. In 2080 the outbreak progression would slow down because the Scots pine (the host tree) shift would be halted by the slow permafrost retreat.